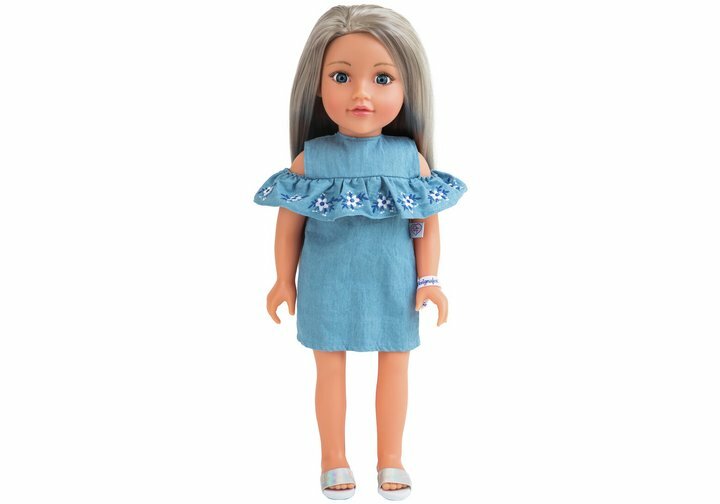 The Chad Valley Designafriend Festival Fun outfit comes with a denim dress with stylish cut out shoulders and gorgeous embroidered pretty flower detail, festival wrist band and eye-catching holographic slider shoes. Your Designafriend will certainly fetch admiring glances from the crowd whenever she's out and about enjoying the festival scene! Doll comes carefully gift packaged in a boutique style box with soft tissue paper and contains a unique charm that can be easily attached to the Designafriend doll charm bracelet. Size H18, W18.5, D4.7cm. Get money off with April 2019 free Argos voucher codes, see if there's a discount code for the Chad Valley Designafriend Festival Fun Outfit product.